I posted this a year ago yesterday, but after seeing the video below I thought maybe it was time to re-feature this helpful tool. One of the biggest parts to saving on groceries is to know what a stock up price is for the products you buy. Prices for each item will vary week by week at the grocery store, and your goal is to only buy them when they are the lowest price the store is going to offer them at. 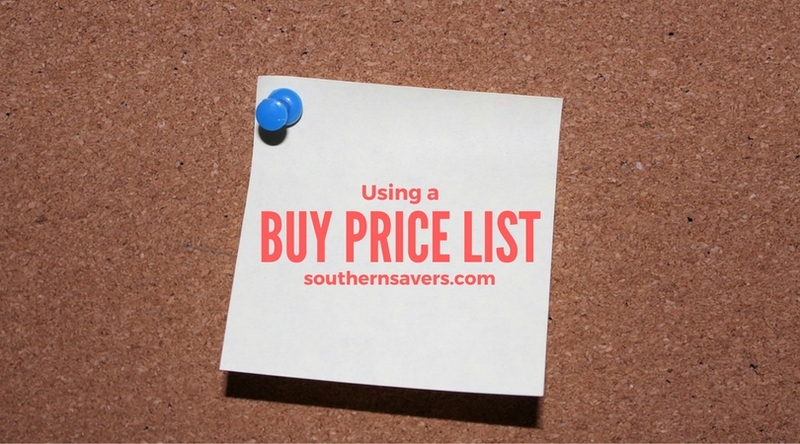 To do this it helps to have a lowest price list (on paper or in your head). When an item is in the price range or lower then you stock up on it!! Sales run on cycles so you won’t see this low price again for 6-8 weeks, get enough to get you through until the next time you see this price. To help you, here is my Buy Price List. To make your own list you can use this Blank Version. For a long time, until I had prices in my head, I kept this sheet in the front of my coupon binder, or folded up in the back of my coupon box. Note: Your prices will fluctuate as manufacturer’s raise prices or as new coupons come out. This just give you an idea to go buy.